A suicide bomber attacked a park in Lahore, Pakistan, where people were celebrating Easter Sunday, killing at least 70 and injuring more than 300, according to the Associated Press. Many of the dead at the Gulshan-e-Iqbal park were children. A spokesman for the Jamaat-ul-Ahrar terror group said that the attack was meant to target Christians and warned of more attacks to come. Pope Francis spoke out against the attacks Monday from St. Peter's Square, calling them vile and abominable. He urged Pakistan's leaders to restore peace, especially for religious minorities. 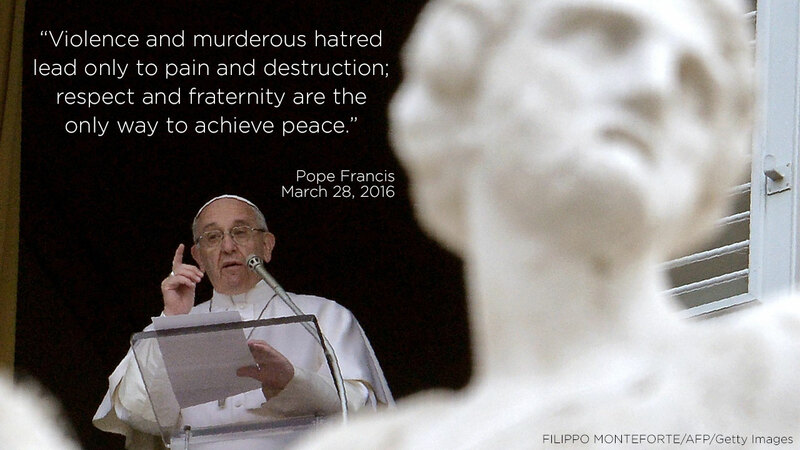 "I repeat, once again, that violence and murderous hatred lead only to pain and destruction; respect and fraternity are the only way to achieve peace," he said, according to Vatican Radio. Other world leaders expressed their condolences and spoke out against terrorism, as with the attacks in Brussels that killed more than 30 people last week. The State Department condemned this latest attack "in the strongest terms." Here's how world leaders reacted to the attack in Pakistan. Nobel Peace Prize winner Malala Yousafzai, who survived after being shot by the Taliban in 2012, issued a statement following the attacks in her home country. I'm shocked by the terrorist attack in Lahore. My thoughts are with the families and friends of the victims. We will do what we can to help. French President Francois Hollande tweeted in French that France stands in solidarity with the people of Pakistan in their time of sorrow. A la suite de l'attentat à Lahore au Pakistan, j'exprime au peuple du Pakistan toute la solidarité de la France dans ces moments douloureux.